Punta Suarez is one of only two visitor sites on pristine Española Island, and it's one of the most memorable walks in all of Galapagos. Punta Suarez features the chance to see the Waved Albatross, an extremely rare endemic species that only makes its home on Española. Visitors will also see the red-and-green marine iguanas appropriately nicknamed "Christmas Iguanas" which are also only found on Española. Punta Suarez is home to large colonies of blue-footed boobys, Nazca boobys, mockingbirds, lava lizards and sea lions. Fortunate visitors may spot an elusive Galapagos Hawk, Galapagos snake or the shy Red-billed Tropic Bird. Note: This spectacular walk is also one of the more challenging in all of Galapagos. Although there are no real hills to climb, the rounded volcanic boulders make for difficult footing. Although the circuit is only about three kilometers long (almost two miles), it seems much longer due to the rough going. In addition, it gets very hot during certain times of year. If you're not in perfect health or have difficulty walking, be sure to consult your guide before attempting Punta Suarez. Guests disembark near the small lighthouse. It's a dry landing, but the rocks can be slippery. There is a rocky point that has been partially covered with a concrete walkway to make the going easier. Look for sea lions sunning themselves, and bright red Sally Lightfoot crabs darting in and out of the rocks. Your guide will probably round up the group near the lighthouse to begin the tour. The lighthouse is a favorite perch of some Galapagos Hawks that live on the island: if you're lucky, you'll spot one there. You'll also see some marine iguanas here: you'll see many more but this is as close as you'll get to them, so be sure to take some good photos. After a short walk to a sandy beach where you'll see frolicking sea lions (and their pups if you're lucky), the trail branches off to the left or the right. The trail is a loop, so it doesn't matter which way your guide decides to go. We'll go clockwise and head along the trail to the left. The trail continues along the waterline, with the ocean on your left. The going is pretty easy, and you'll see more sea lions, Sally Lightfoot crabs, blue-footed boobies and marine iguanas. By now you'll have attracted the attentions of the Española mockingbirds, who will flit and hop alongside you as you go, hoping for a handout from your water bottle. Keep one eye on the tranquil waters to your left: the shallow bay is popular with sea turtles who will occasionally surface for a gulp of air. After a short walk along the waterline, the trail takes a right into the vegetation and the coastal pebbles give way to large, rounded volcanic boulders. This is the hardest part of the trail to walk. The vegetation on either side will be over your head, but it does open up at one point near a large, craggy rock where a colony of Galapagos Hawks makes its home. Keep your eyes on the ground and you'll see lava lizards and possibly the brown Galapagos Dove: look for the distinctive blue rings around the eyes. The Rocky Maze opens up near the other coast onto a field of boulders. During certain months of the year (April-December) the area will be home to hundreds of Waved Albatrosses, who occasionally waddle up to the edge of the cliff and take off. They're very fun to watch. 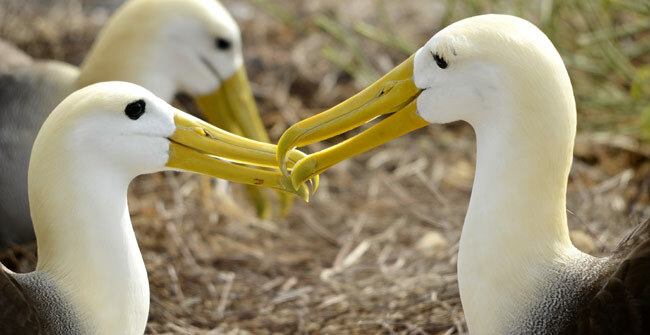 During the months of January-March, the Albatrosses are away feeding, but you may be fortunate and see one or two. After the Albatross Runway, you'll arrive at the most beautiful part of the trip: a trail on a rocky bluff about fifty feet above a crashing surf. There are many rock formations here and plenty of birds, iguanas and lizards taking a break or sunning themselves. Be sure to get a good photo of yourself against the gorgeous backdrop! Further along the trail is a blow-hole: a hole in the rock down below that shoots water into the air when a large wave hits it just right. The trail continues along the bluff for a while, passing several scenic spots before dipping down to a rocky area populated by countless Nazca Boobies and Marine Iguanas. Just before the dip, there is another rocky field which is home to more Waved Albatrosses. Keep your eyes open when you climb back up onto the bluff: sightings of the very elusive Red-billed Tropic Bird occasionally happen here. From the High Coast, the trail wends its way back to the lighthouse, mostly passing along another bluff, not quite as spectacular as the first one. It is still beautiful, and you'll see many boobys and iguanas as you go. Once you reach the lighthouse, your guide will take you back to the ship for a well-deserved rest! The visit to Punta Suarez takes about three hours.